Perfect fit for 4 credit cards and cash. Each slot contain 2 credit card. 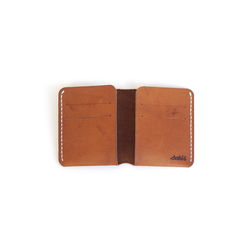 Natural variations in the leather surface are the evidence of real hide. Stiching is made with individual holes punched by hand and sewed in the traditional way with waxed linen thread. All edges are finished by hand too.